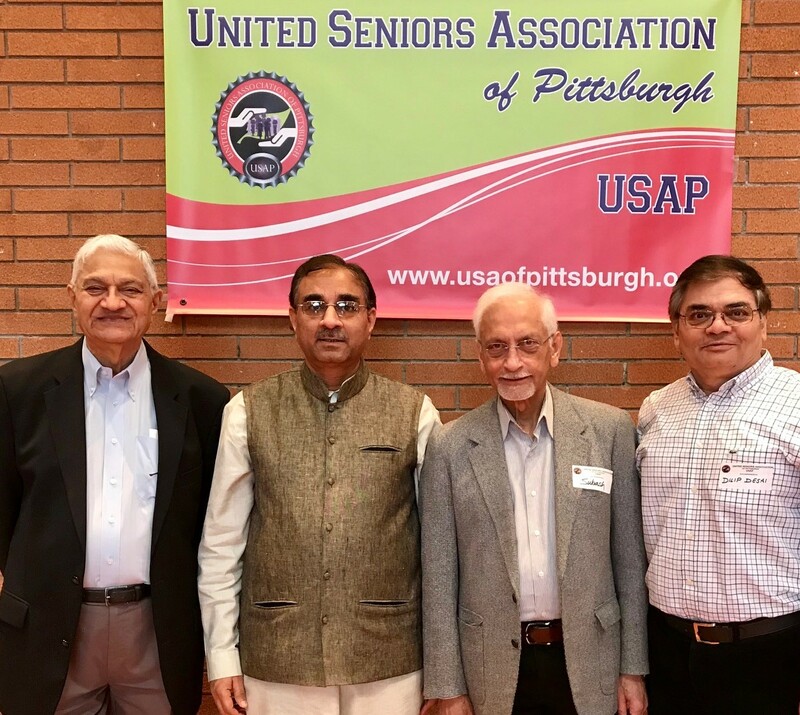 Founded by Pittsburgh’s senior citizens to serve the interests of Pittsburgh’s senior citizens and open to all senior citizens regardless of creed, color and country of origin, here is the United Seniors Association of Pittsburgh (or USAP for short). USAP was founded in December 2017 and registered as a non-profit organization in the Commonwealth of Pennsylvania. It has also received approval as a tax-exempt 501(c)(3) charitable organization from the U.S. Internal Revenue Service. To promote healthy aging through education, participation and social support, and thus, dignity, independence and longevity of its members in their senior years; and provide a forum that would encourage able seniors to help fellow seniors in need, with goal to minimize their dependence on society. Current office holders L to R: Rajnikant Popat, Chetan Patel, Subash Ahuja, and Dilip Desai. Two hundred and forty-two senior citizens of Pittsburgh have already become members of this rapidly growing organization. This includes 31 life-time charter members. USAP members are vibrant professionals from all walks of life — doctors, engineers, computer specialists, teachers, businessmen, entrepreneurs — with wide interests and passions on diverse topics. A three-week organized tour of eastern Europe! One might think that all this must amount to a big fat membership fee that a middle-class senior living off his or her limited life savings and Social Security income can only dream of. Nothing could be further from the truth! Now get this: It is only $30 per person for 2019. This number was at the insistence of the all members because refreshments and snacks are served free of charge at these events. Beverages like tea and coffee are always on the house at all events. And one could go for Charter Membership by paying only $ 500 per person. Mr. Girish Thakar (Life and Finance Planning), Dr. Chetan Ladani (Health and Fitness), Dr. Ved Kaushik (Hobby and Sports), Chetan Patel (Cultural, Social and Humanitarian), Dr. Kiran Bakshi (Tours and Travel), Mr. Jayant Mirani (Membership) and Dr. Juginder Luthra (Social Media and Publications). This entry was posted on January 19, 2019, 1:22 pm and is filed under January 2019, Past issues. You can follow any responses to this entry through RSS 2.0. You can skip to the end and leave a response. Pinging is currently not allowed.